Welcome to Admiral’s Landing in Provincetown, MA! Our 1860’s historic and friendly Provincetown bed and breakfast is centrally located just one block from Commercial Street and the bay – at 158 Bradford Street on the corner of Pearl. While staying with us, you’ll be just a short walk to a wide variety of restaurants, shops, and galleries. Unlike other hotels in Provincetown, MA, we are also just around the corner from the Fine Arts Work Center and the thriving gallery district. Provincetown is a unique travel destination, like nowhere else. There really is something for everyone here – unique shops and boutiques, fine dining and cafés, galleries and theater – beautiful untouched beaches, sand dunes, whale watching, nature and bike trails, and more. Recently renovated, our women-owned Provincetown B&B provides accommodations appointed with amenities designed to make your stay in Provincetown memorable. Each of our guest rooms at this Provincetown hotel includes a variety of deluxe amenities, including fireplaces, complimentary Wi-Fi and a delicious homemade breakfast every morning. 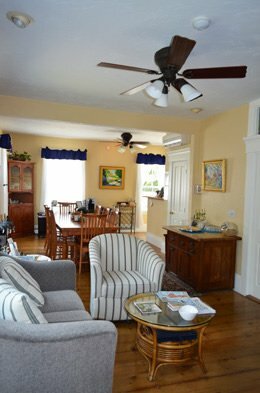 Our beautifully-decorated inn is bright and well-appointed with Provincetown art and comfortable furnishings. Rooms feature private baths with large waterfall showers or air-jetted pedestal tubs for our guests’ comfort and relaxation. Choose from a total of eight guest rooms between the Main House and the Cottage at this beautiful Provincetown bed and breakfast. Unlike other hotels in Provincetown, MA, our additional cottage in the back of our Main House features two studios and our Waves Penthouse. We encourage guests to escape to our private courtyard or garden patio, while enjoying a plate of homemade breakfast or simply relaxing and enjoying the company of others. Guests will feel right at home at this bed and breakfast in Provincetown, MA. Whether you’re traveling as a couple for a romantic getaway or planning a weekend retreat, let Admiral’s Landing welcome you to beautiful Provincetown by making you feel right at home during your stay. Contact us to learn more about our Provincetown B&B or to learn more about this wonderful town. Visit our little town at the tip of Cape Cod – it’s so easy to get here, but so hard to leave! Book directly with us to get the best rate and find out about Last Minute Availability and Specials.